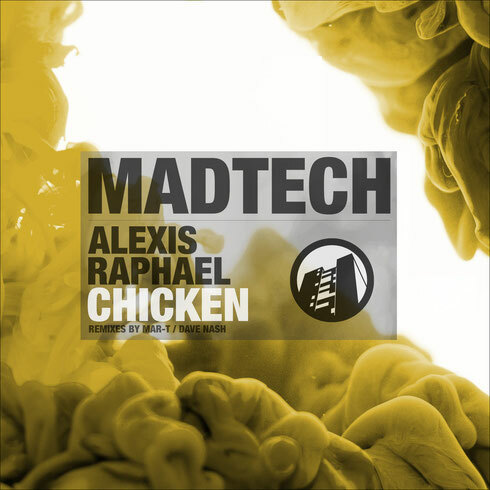 The MadTech Records imprint is back with the ‘Chicken’ EP from the UK’s Alexis Raphael, backed with Dave Nash and Mar-T Remixes. Alexis has come a long way over the past few years since initially stepping onto the scene via Jamies Jones’ Hot Creations in 2011. Since then, he’s had releases on Leftroom, Culprit, Lower East, Moda Black and MadTech, where he returns to here. On the flip side of the package the title track gets two reworks, firstly from Cocoon Recordings artist and Amnesia Ibiza resident Mar-T, who reworks the track into a stripped back number with sweeping atmospherics, growling bass tones and bubbling melodies. Portugal’s Dave Nash then rounds off the package with his take on ‘Chicken’, delivering a smooth and hypnotic interpretation fuelled by fluttering pad lines, snaking sub drones and evolving stab sequences. Alexis’ prevalence is displayed throughout the ‘Chicken’ EP as he ebbs and flows through weighty low slung grooves, bumpy bass hooks and infectious vocal loops with title cut ‘Chicken’ and the mesmerising ‘Phantom’. Have you ever considered about adding a little bit more than just your articles? I mean, what you say is important and all. However just imagine if you added some great photos or video clips to give your posts more, "pop"! Your content is excellent but with pics and clips, this blog could certainly be one of the best in its field. Very good blog!